I'm going to put together a guide on our strategy for completion, focusing primarily on the end fight, as I imagine most groups will have the puzzles done by trial and error quite quickly and the guardian fight isn't too complicated. 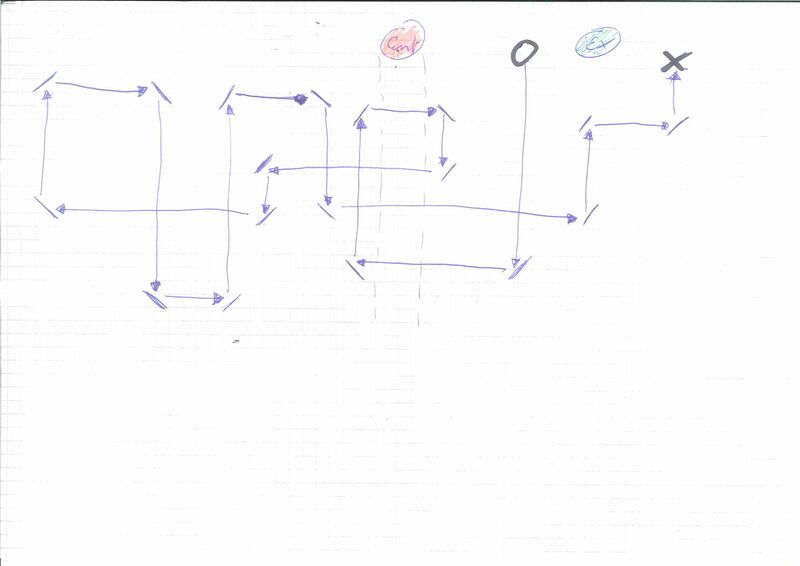 I'll maybe come back and expand on some of the notes we made on the puzzles and with any luck people with better image crafting skills can post better visual aids. I'd also note that this was simply our approach to tackling this raid, you may have different preferences, but I figured that posting here would perhaps save some people a lot of resources and some time. One final thing. As you might imagine this guide is pretty spoiler heavy, that's the point. There's a lot of merit, not to mention challenge in seeing something fresh, so if you are considering doing it you might want to use this as a reference only if you get stuck. The mirror puzzles consists of two crystals, one horizontal sender and one vertical receiver. The light beam emerges from the sender crystal and bounces off mirrors until it reaches the receiver crystal. Mirrors can be oriented in any of 8 possible directions, however, only 2 positions can actually reflect beam, sending it either on a left or right turn. Currently clicking a mirror too quickly as you turn it may render it unable to reflect light. "Refreshing" or turning the mirror again fixes this. Anyone standing in the path of the beam when this happens will take approximately 2000 damage. It is best to stand behind the mirror relative to the origin of the beam as the beam will never pass through the mirror. Standing in this spot also gives the best view, as looking left or right will quickly allow you to determine the path the beam should take. In almost every case, if standing behind the current mirror at the end of the beam, checking left or right will reveal one of those directions has a mirror and one of those directions lacks a mirror. Turning the mirror to direct the beam to the next mirror will allow you to progress the beam along. Repeat until solved. With an inexperienced solver, the puzzle is best done starting from the sender so that he or she may see the beam and bounce it along the mirrors until he reaches the receiver. With an experienced solver, the puzzle is best done backwards from the receiver so that he may position the mirrors without bouncing the beam everywhere and endangering his teammates. Doing so requires that he keeps track of where the beam would have been and would go but without being able to see it. Once solved, he announces it to his party so that they can clear the heck out of the way and he sends the beam down the path of mirrors. The mirrors can also be solved by two people at the same time, one starting at each crystal and meeting up in the middle. The maps always face the castle. Sorry, didn't bother with this. It's straight start to finish, no tricks or weird things. If you understand the basic concept you should be able to solve #1 without any issue. 2 The most challenging I think. Two light beams - work in teams. This one needs the initial sender turned by 90 degrees! The helmed horror needs to be killed in order to activate the sender! -On two occasions during the raid you will arrive at a puzzle room. 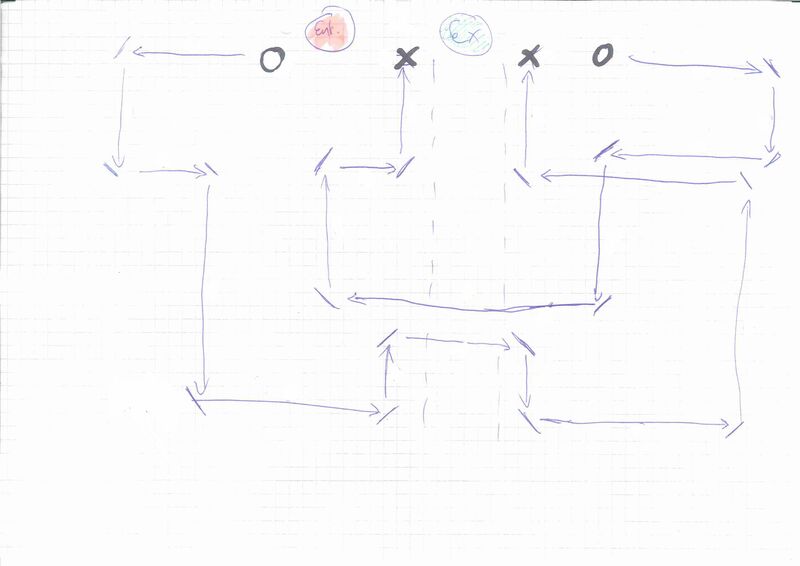 -There is a choice of two puzzles, chosen from a possible three for each stage. -The second portal stage includes the Red/Green Room, the Gravity room and a room I refer to as the "Shadow Tower"
-The jumping puzzle, dwarven maze and later the gravity room contain no enemies. Gravity should in theory consume less resources than Red/Green though it requires two players to pass through if someone has been knocked off or is late. - Jump up the ledges and destroy the phylactery. -Boots are not required. If you get to the point in the below video where I use mine (this should take you about 30 seconds with FF and some practice,) you can jump out to the first jut in the wall. Line yourself up facing the side of the room you are headed to, make sure FF is on and just push forward. You will catch ledges and run across. I'll maybe get some footage of this method, but TBH cannith boots aren't a hard grind for the time and frustration this part causes people. -Room A: Rune straight ahead. Portal on Left and Right. Portal Behind. Room C: Rune straight ahead. Portal on Left and Right. Targetable res shrine behind. Room D: Rune straight ahead. Two portals on Left. Room E: Rune to right. Portal Left and straight ahead. Room F: Two portals on left with rune between. Portal straight ahead. Two portals on right. One portal behind. Room G: Rune straight ahead. Portal on Left and Right. Way out behind. - If you take the wrong exit you end up at a dwarf that you can talk to and then just die unless you are able to Ddoor out. You respawn at a Res shrine and can do it again. - The riddle is always a statement if left or right and two more statements: whether the previous statement is false or true. Randomly mixed. - There is one room with 6 portals. The correct Portal is either left or right of the speaking stone. That brings you to the last room. If you take the correct portal in this one you end up in the first room again. The key is to not take any portal and just jump up (there's a ledge). Destroy phylactery on other side. 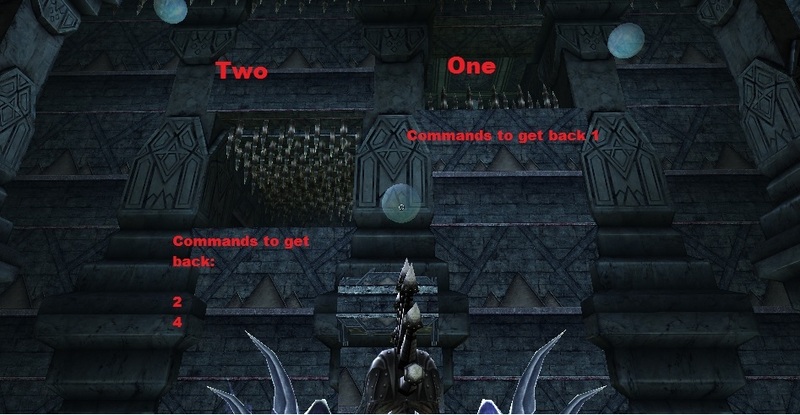 - A lever that can be used infinitely opens the first gate into a two story "cage"
-After dealing with spellwards and any trouble mobs Group A let Group B through the first lever and follows behind. Group B pulls the lever on the second level and this lets Group A through the gate on the second level. Group B can then let Group A through and kill the phylactery. -After this point,the door on the second level cannot be reopened. Its possible that killing the phylactery prevents the second lever from working. It's worth noting that if this stage has been progressed through and you have latecomers, re entries, get blown back or have to Ddoor that you won't be able to proceed up to the top level this way. 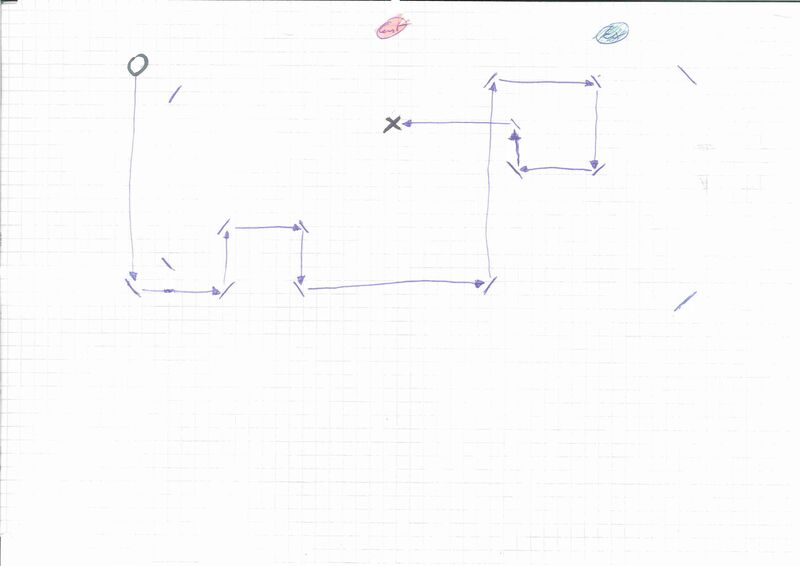 Eventually you will be able to solve the alternate puzzle and hopefully pass through that way. Go get jumping! - You get killed when you move in the red phase (check debuffs). - Jumping counts as moving. - Spell absorption prevents death from moving during the red light. - Several stages of pressure plates that open the first gate. After more tunnels and helmed horrors you arrive at a beholder, a final helmed horror, some pressure plates and the phylactery. -6 pressure plates need to be a activated, spread through a maze think crucible swim without the water. - There are two buttons, one at start and the end that activate/deactivate gravity. Person on a button cannot move while gravity is on however they are protected from flying up to the spikes by a small ledge over both controls. -The party should split up and cover all five pressure plates to open the phylactery. We had our button presser stay at the start and alternate on and off every five seconds or so. 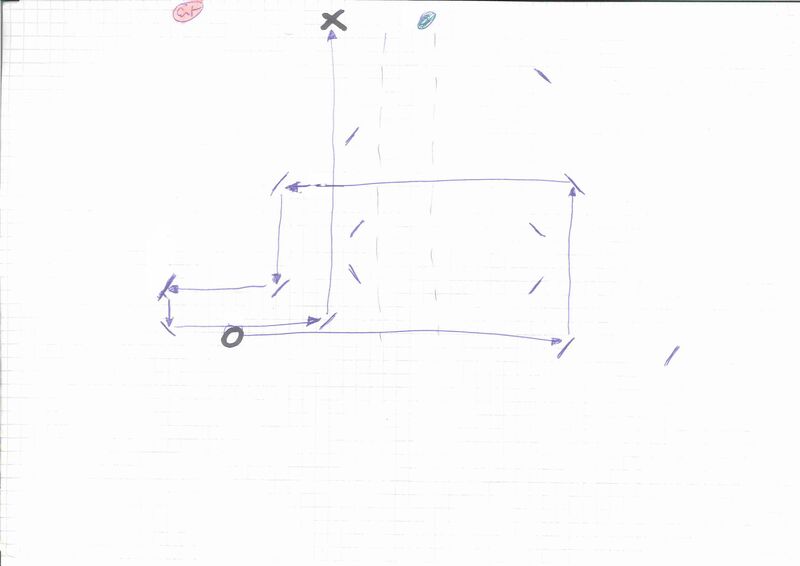 -Evasion characters still took considerable damage while moving through but with good self healing were able to work there way over a series of high walls towards the pressure switches. -To reach the end gravity button and the phylactery we took the left route from the start and tried to stay on the bottom level, turning right when faced with a junction. Once there we could direct our pressure switch to steam to get in position and destroy the phylactery, then use the gravity button to get them to the end. -From the start there are four possible corridors players can take. Two are high up and require low gravity and on either side of the first gravity button and two that can be dropped into. -A safer way to do this would be to send players one at a time, but that will take longer however they have more control of when gravity is on and off. -In the screen shot below send one player downwards and to the right, then two people left. Left is also the way to progress to the phylactery - to do so drop down and turn right when you get to a junction. One player will split off and find the pressure plate hidden in a corridor accessed near one of the spiked roofs. The other will head to the phylactery room and can control gravity. This way your initial gravity puller can progress through the maze or give help where required. You emerge into a tall room with a climbable tower and mob spawns at the pinnacle (Dragon Disciples, Skeleton Archers, Bone Boys and Helmed Horrors.) The Phylactery is located to the north, surrounded by a force field. This process is repeated till the phylactery has been destroyed. It's worth noting that if you don't jump down in time and aren't wearing spell absorption then you can take massive bomb damage. It's prudent to have a caster or two parked at the bottom of the tower and as the shield is lowered get them to drop their most powerful DOTs on the phylactery - the damage over time effect will tick away even while the shield is up. - Sacrifices trash mobs to regain 100% health. - You can leave one mob alive to prep him (about 15% EN maybe 40% on EE). - Needs to go down quickly when you take out the last mob because they respawn and can be sacrificed.This part was bugged for us in that a skeleton would spawn, but was stuck in the floor and couldn't be killed - the guardian was still able to sacrifice him though. - He is not undead but a living construct. One person should carry a blasting chime. The central circle of this arena (which will used as part of our dragon killing ritual later) is surrounded by spellwards. These should be the first thing that are dealt with once aggro is picked up. The Tank/Kiter (we used both) is going to be looking after the dragon, which in all honesty doesn't feel like too much of a step up from TO. Those familiar with holding his aggro and dealing with debuffs and aoe breath should find their feet quite quickly. Deathblock. Remember while debuffed you are immune to deathward. The Kuldjargh Kiter (we call them Bone Boys for for pronunciation sake) works best as any quick moving character with wings/abundant step. The bone boys will drop a harried debuff on you as well as a slow effect, and this is trouble for the Wyrm tank. Treat these as you would the undead dragons. They have high fort and and felt like 3x caught in the web mistress HP, high enough that they can't be easily taken down. We have yet to try a full blitztard build in here, but that's certainly the only way you could work in killing these guys. As it was we allocated a kiter and that kept things under control reasonably well. Healers should look after the two key roles above and do all the usual magic you guys can do to preserve SP at this stage. Good luck. DPS play a fluid and crucial role here. Periodically Dragon Necromancers will spawn in and provide the dragon with stacking dr vs magic and physical damage. I haven't tried EN but EH and EE felt like a spawn every 30 seconds or so, in addition to a handful or skeleton archers. Don't forget you have bone boys chasing you around as well, but hopefully the kiter has those under control as you will need to be moving and communicating well. With five Necromancers active the dragon is nigh-unkillable, so it's important to maximise dps on these guys kill them before you get multiples stacking up, and direct burst dps onto the dragon at one/no remaining Necros. Proceed as above till roughly 50% of the dragon's HP. Then you get a curveball. You can put a dedicated blitzer on killing archers, ignoring Bone Boys and trying to keep the DA down. This may help with lag when people step through portals in the next stafe and a bunch of shadows spawn. Some DM text drops saying the dragon has dispatched shadows. Here the DPS must split off. Killing shadows will drop a very brief portal, which gives you access to the shadow side, which contains the dragon's phylactery. I'd estimate the portal to last for about ten seconds, at least it certainly felt that way as things were very frantic. Again communication and preparation are essential to ensuring that you don't miss a portal over to the shadow side. These shadows will continue to spawn as you beat down the dragon from 50% health or so. In the event you make a mistake you can port to the shadow side any time you get a fresh spawn by killing one and taking their portal. We found that there was a time limit on a shadow's ability to create portals, so we could not keep some alive for when we needed them and had to wait for more to respawn. Using this mechanism we can fight the dragon in the arena and go and beat on her real phylacteries hidden on the shadow side before obtaining shards of her real phylactery and using them in a ritual in the main arena that must be triggered at the moment she dies, in the center circle. The tank and kiter should have a babysitter and will be staying in the fight with the boss dragon, as there needs to be someone alive there for the shadow side to be active. If everybody does die in the main room, all those with the phylacteries will be ported back. Hold tight. You may wish to keep a resilient second kiter as a backup or to kite extra mobs. You could additionally remove people from your shadow side kill team and maybe continue killing dragon disciples, but as success is crucial when killing phlyacterys you really want to put some assets there. The kill team will ready a shadow to be killed and step through the portal when everyone is nearby. You are now teleported to the shadow side of the raid. Here you face a room with two deactivated source crystals identical to that used in the mirror puzzle. You must kill a helmed horror and an anti magic beholder in order to activate these in addition to some trash shadows. They can be rotated to activate pillars 1 to 3 on one side of the room, and 5 to 6 on the other. 4 appears inactive at this time. Once the room is clear, direct the beams to the portals, split up and head through. One of these portals holds the true phylactery and the others duds. Inside are a few trash shadows and more phylacteries. Deal with the shadows how you like, prep the phylacteries and kill simultaneously. The margin for error is very small so this really has to be done in unison. We split off into three teams of two and killed, risking another beat down if we chose three dud portals - ideally you populate every portal and do this without chance of missing. While ranged characters may be okay soloing, melees might have a tough time with the shadows. They don't have ridiculous amounts of HP and can be killed off with a slow respawn rate, but that does take some time and this is quite intense. Communication is key again, try and stay cool and just wait for the order to kill. Right now the quest is bugged so that we cannot enter one portal. Although this provides an interesting dynamic, you may find that you populate every portal and don't get the real thing. If this happens or for any other reason you don't succeed, just beat down on the dragon till you get some new shadow spawns and can teleport back back to shadow side. After the phlyactery is killed you will get another DM text and port back through to the main room side. Continue to work using the 100% - 50% method, you may have quite a few necro disciples by this point so watch out for 600 - 800 hp disintegrates and insta death spells. Glorious Dawn from Wheloon is a nice one to slot on here and throughout the raid as the dragon's debuff dispells deathward and makes you immune for 60 seconds. Continue to DPS the boss until you get another spawn of shadows. Once again you must send people through, only this time to receive phylactery shards, which will be in the center of the room when you port through. They are exclusive and everyone must pick one up and return using the portal to the main fight, eight in total. If you can't get or spare eight people through at once you will have to make more than one trip, probably waiting for more shadows. Now the game is on and the party must DPS the boss down to near dead. All those with phylactery shards should slot them into the central circle of the arena, and these make a set of levers activate to prevent our dragon from rising again. With the dragon prepped the tank/kiter must hold her attention in the center, while the lever pullers get ready. Once the "crush it" order comes over from the party leader having seen the dragon drop they pull and she is prevented from rising. At least in theory. Screwing this up is painful indeed. Warning We ran into an issue tonight where a player was dead in a phlycatery portal after the endfight. The dragon had died and there was no more shadows to port back to him. Even after completion his stone was stuck there, and although on that occasion a GM fixed the issue we were advised that this would not always be the case.If you have someone dead on the shadow side you must retrieve them by killing more shadows and porting back before you down the dragon for the final time. Here is a video of our third dragon kill/lever pull and a selection of our reactions after five hours of questing. Unlike the others this was done with nine very stressed people and as you can imagine the language is a trifle coarse, so watch at your own discretion. We'll be posting the whole thing (5+hours) soon. The dragon fight is currently bugged in more than one way, and the guardian was at times impossible for us to kill due to the stuck skeleton but these things will be ironed out soon hopefully and this can be enjoyed properly. If those that have run through have any other puzzle hints then hopefully they post here. Credit goes to various Omni members for the youtube videos and write-ups/pointers on mirrors and other puzzles I didn't see. Last edited by blackdoguk; 03-26-2014 at 02:06 PM. Reserved for screenies and other guff. 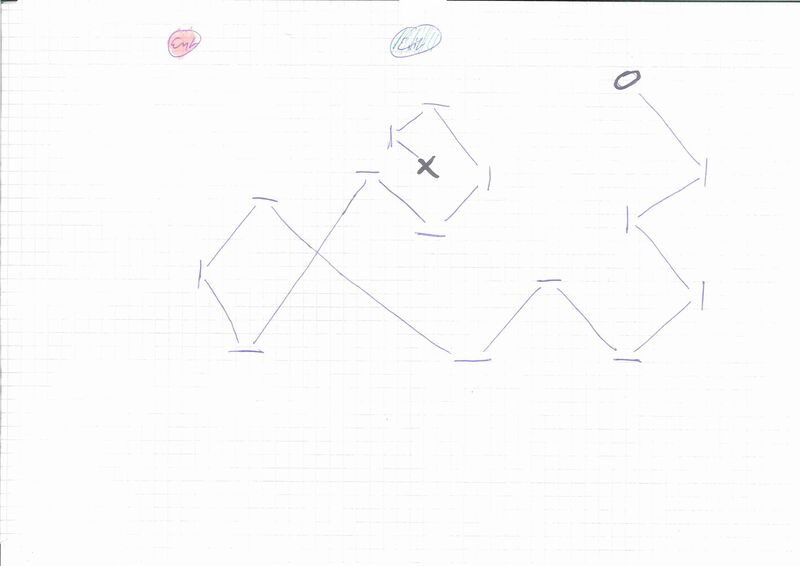 I can also scan in and upload my horrible hand drawn scetches of the puzzle solutions. 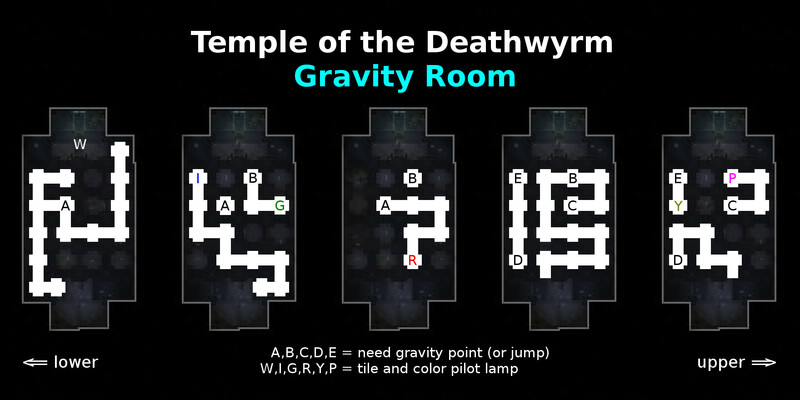 NEW: Temple of the Deathwyrm can become incompletable if players complete the second of two available first floor interior rooms. 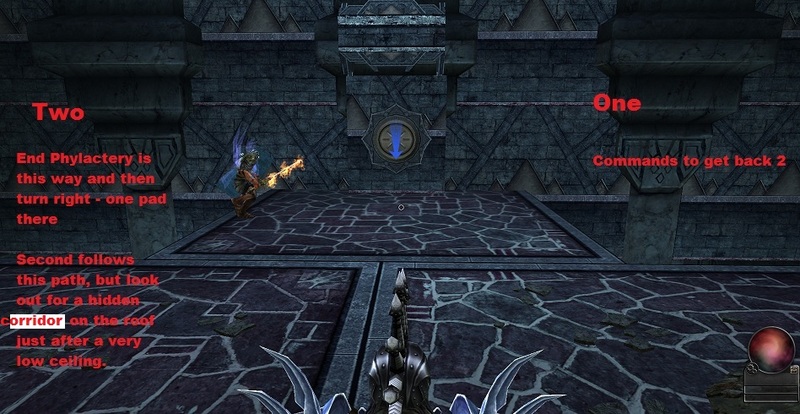 Players should only complete one of the two rooms in order to prevent the raid from becoming incompletable. DO NOT complete both puzzle rooms at the set of the first two puzzles! If a player dies they cannot be raised, a wraith spawns and must be killed in order to return. This applies to the end fight also. Self raises work, and spawn screen does not prevent the wraith from appearing. Devs...really? Like Spawn Screen was so overpowered, so now you have to go out of your way to prevent it from doing...the ONLY thing it's supposed to do? Yes this. A thousand times this. Looking forward to seeing your design skills Eth. As for spawn screen, yes I did find it odd that it wouldn't work in the one place you would expect it to. Going to do another tonight and get some more defined tactics for gravity room. Would love to get a map done tonight. We've been trial and erroring our way through the puzzle and alternating the gravity switch every 5-10 seconds or so and then stationing people at the pressure switches. Once theer its usually possible to find a spot where you dont get hit by spikes. OP updated with a video guide to the jumping puzzle. Last edited by blackdoguk; 03-11-2014 at 05:23 PM. Our kill team will ready a shadow to be killed and step through the portal when everyone is ready. You are now teleported to the shadow side of the raid. Here you face a room with two deactivated source crystals identical to that used in the mirror puzzle. You must kill a helmed horror and an undead beholder in order to activate these in addition to some trash shadows. They can be rotated to activate pillars 1 to 3 on one side of the room, and 5 to 6 on the other. 4 appears inactive at this time, I think this is intended. Just tried an EH run and we got stuck. On the shadow side we had 3 available portals on the NW side, 2 (not 3, 1 was blocked by a pillar) on the NE side. The 2 mirrors on the side you spawn on could not be reached because the beams were blocked by a mysterious force (lol). We tried all 5 available portals, killed the phylactery and nothing. (Last run on EN we didn't have to kill anything simultaneously, so I expect this doesn't have to be done). Put up a ticket only to find a GM telling me how the raid should work AFTER this phase (so helpful). Any clue what we have missed? Or was it simply bugged? Should that situation occur, however, the Raid is still completeable. Sorry you guys had trouble in there, but it's shown me a part of the guide I was quite vague on. As Steelstar says your phylactery was in the portal I think of as portal four and was therefore unkillable. If this happens again you can port back and try again, as you can at any time using the shadows that spawn from the dragon with the DM text. Doing so will position the real phylactery in another one of the six rooms. So in future if you didn't get the real one port back after being drawn back to the main arena and repeat your tactics I'm pretty sure the Helmed horror and Beholders only spawn once. If later when you need shards for the end ritual you don't manage to get all eight in one go you can continue to port back for as long as you stay alive. Thanks for the response. I actually kind of like the 1 in 6 chance to get a dud and have to do things again, makes the ritual feel a little ancient having one of the portals decommissioned like in PoP and also gives it that random feel. Last edited by blackdoguk; 03-11-2014 at 09:49 PM. Interesting. So it was indeed sort of bugged. Did not know that everytime the shadows spawn, the phylactery moves. Can anyone confirm this please? We must have been really unlucky then, I think we've killed well over 15 phylacteries and did not get the right one lol . Last edited by Epicstorms; 03-11-2014 at 10:20 PM. I misunderstood you. You want to prep as many phylacteries as you can and kill simultaneously. Each sending crystal can open one portal at a time, and in this fashion we usually prep three and step through at the same time. You could in theory pop all five and head through but I haven't tested this. I'm going to try and get a footage capture/plan tester run later this week, but by then someone else might have sleuthed out more than I have. Last edited by blackdoguk; 03-11-2014 at 11:26 PM. Actually, I think that when a phylactery gets destroyed, any persons that are still in a room will get thrown out after a couple seconds? That's right. Killing as many phylacteries simultaneously is the more efficient way of doing it. The second way still works, it could just potentially take a lot longer. The window there is really small. I would say 3-4 seconds after the first phylactery gets taken down everyone on the shadow side gets teleported back. The real phylactery is never static so each time you redo this part it might be another room. We had a run yesterday were we killed 5 phylacterys at the same time and didn't get the real one. Edit: Edited out the maps so they not show up twice in this thread. Last edited by Eth; 03-12-2014 at 03:39 PM.